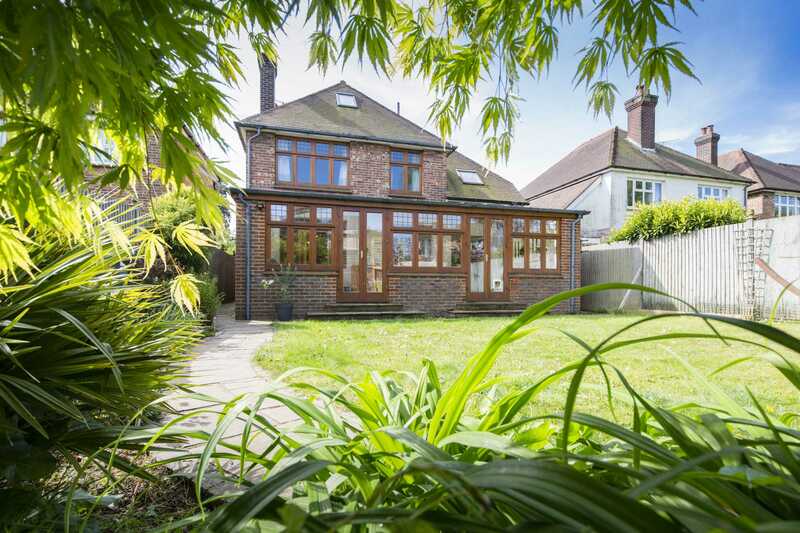 SOLD BY FLYING FISH PROPERTIES Tucked away in a leafy corner of its quiet residential cul-de-sac, this fantastic family home`s curved brick wall and wooden gates set it back from the street, providing off street parking for two cars. 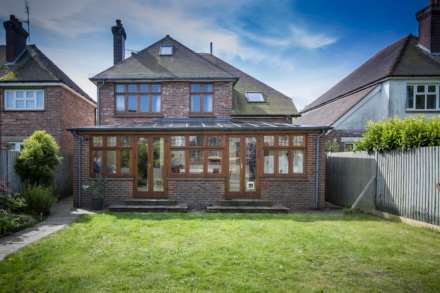 It has a smart red brick and part hung tile exterior with wide original leaded bay windows. A part stained glass door opens into a wide entrance hallway. An under stairs open storage space has plenty of space for coats and shoes to keep the hallway clutter free. 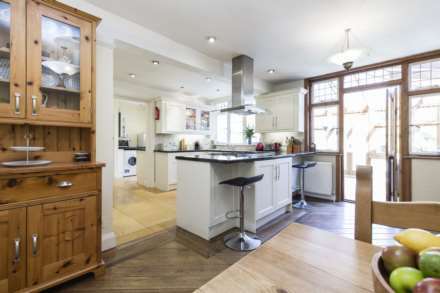 To the right, the spacious living room`s large bay window which overlooks the street draws light into the room. It is a welcoming space with wooden flooring and a stone surround fireplace enclosing a gas fire which adds warmth. 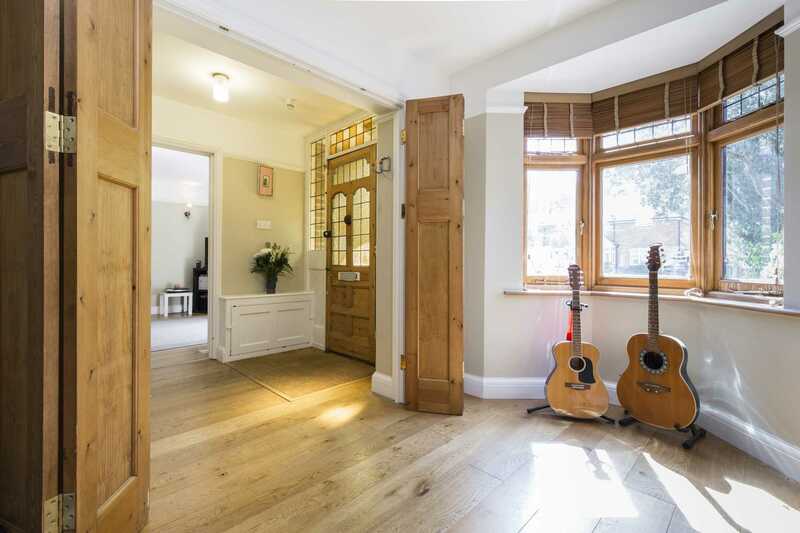 Across the hallway bi-folding wooden doors open to a second reception room currently used as a music room but which would also make a perfect play room or home office. The kitchen, at the rear of the hall is light and spacious with plenty of cupboards and worktop space and an integrated range oven and 8 ring gas hob set into its island. 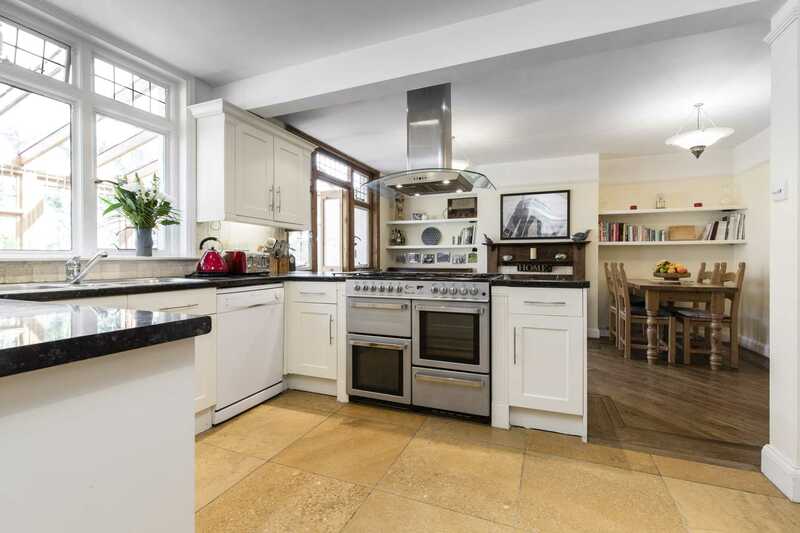 There is ample room for additional appliances whilst the dimensions of the room cleverly define a dining area with ample space for a table and chairs, a focal fireplace and alcove shelving to the side. 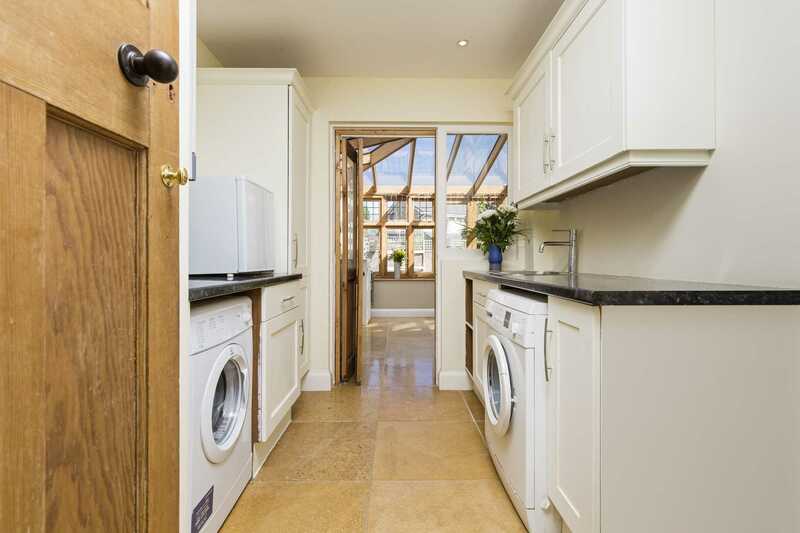 Off the kitchen is a separate spacious utility area with a useful guest cloakroom and access into the spacious conservatory at the rear. The fabulous glazed conservatory is a real show stopper both in terms of its impressive size and creative design. Accessed directly off the kitchen/dining room and overlooking the garden it brings the outside in offering comfort and play in equal measure as you are warmed by the sun. 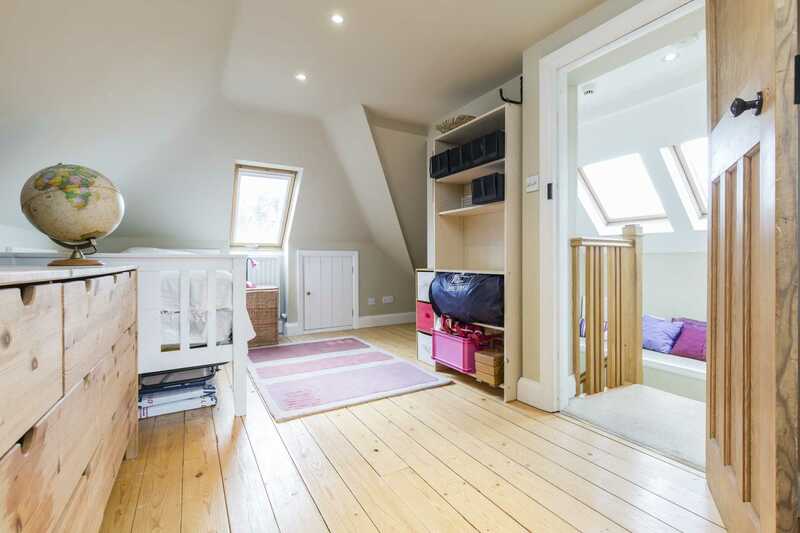 The master bedroom, set to the front of the house, has a wall of fitted wardrobes, a generous bay window and a spacious en-suite which add to the feeling of luxury that the room certainly delivers on. There are three further bedrooms on this floor, all beautifully presented, spacious and light. 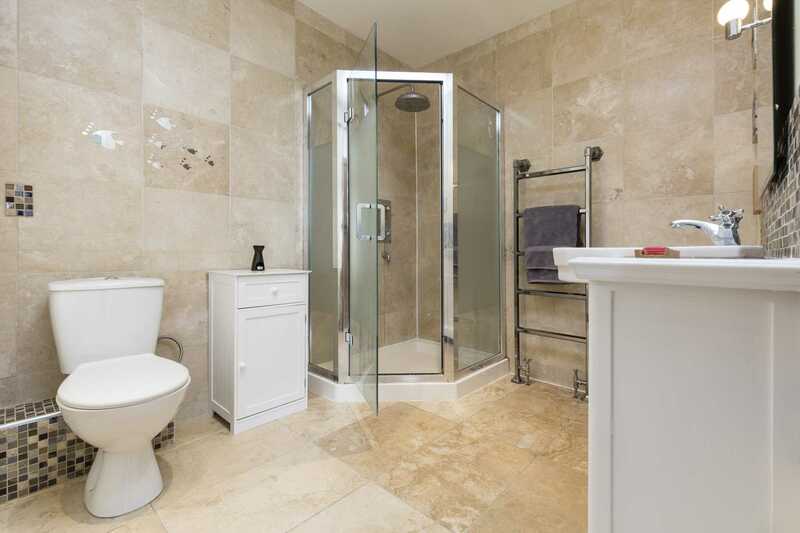 The family bathroom is fresh and modern with a bath with shower above, heated towel rail and a Velux ceiling window bringing in lots of natural light. A further flight of stairs take you up to the fifth bedroom whose honey coloured wooden floor is dappled with light from its dual aspect Velux ceiling windows. 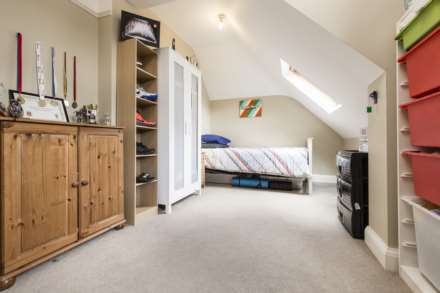 It is a generous sized room with plenty of eaves storage, even on its landing. At the rear of the garden, a stone terrace, perfect for alfresco dining, sits beside a wooden summer house providing respite from the midday sun or a playhouse for the kids. A paved curved pathway meanders down the side of the lawn edging pretty flower beds stocked with mature plants, trees and flowers. It carries on up the side of the house giving easy access to the front garden and street beyond. 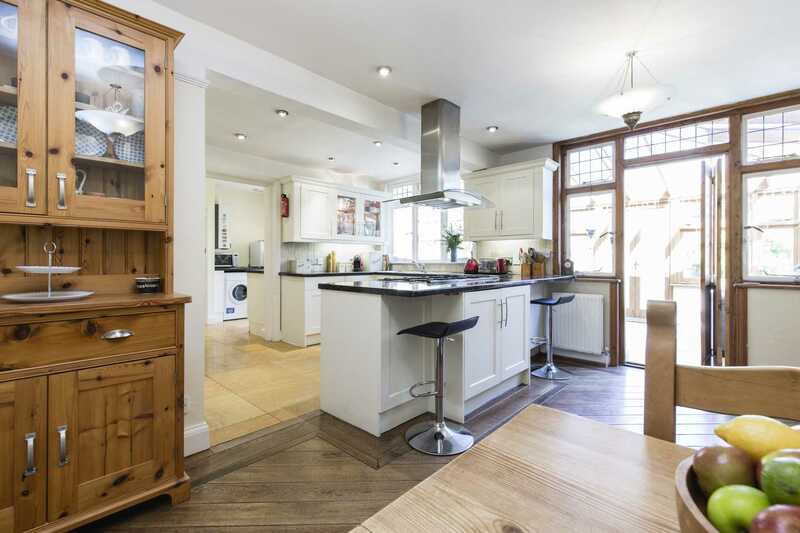 This substantial family home, set on a popular residential street only a short walk from local shops, sought after schools and excellent transport links, is ideal for a growing family. A must see! 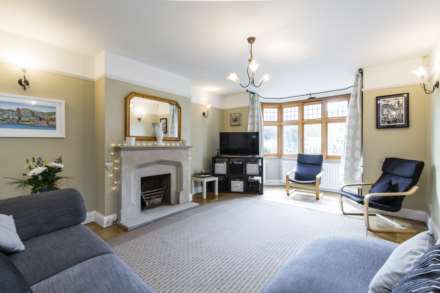 Sitting room: 18`8 x 12`6` part leaded front aspect double glazed bay window with views of the street beyond, fireplace with cast iron insert gas effect fire with caved stone mantle, surround and hearth, wooden flooring and radiators. 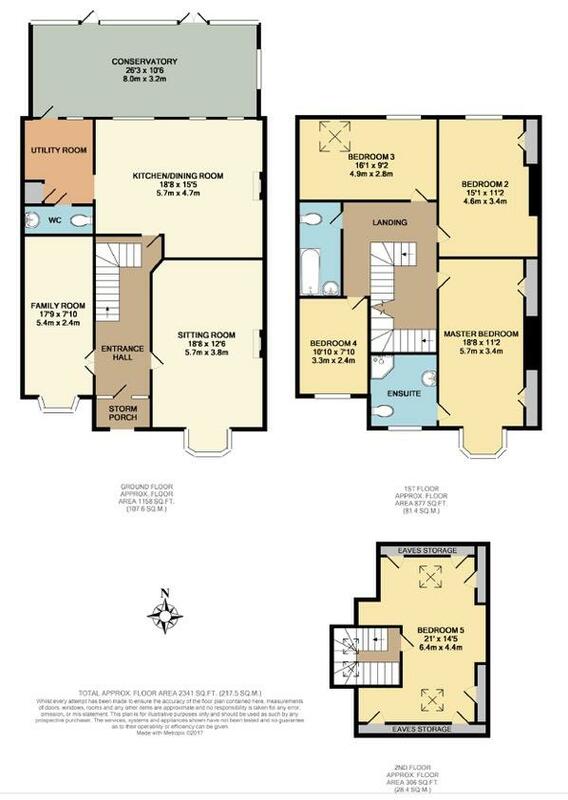 Family room: 17`9 x 7`10` part leaded front aspect double glazed window, wooden bi-fold doors into hallway and wall mounted thermostat for underfloor heating. 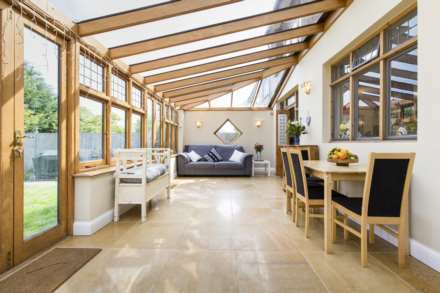 Conservatory: 26`3 x 10`6` double aspect rear and feature side double glazed windows overlooking the garden with fully glazed French doors opening onto the garden, glazed roof and tiled flooring with electric underfloor heating. Utility: part glazed bi-fold door into conservatory with side window, doors into kitchen and cloakroom, tiled floor with electric underfloor heating, stainless steel sink with mixer tap over, selection of wall, base and larder pull out units, worktop space, space and plumbing for washing machine and tumble drier, wall mounted Potterton Performa system gas boiler and built in cupboard housing Heatrae Sadia megaflo water cylinder with controls. 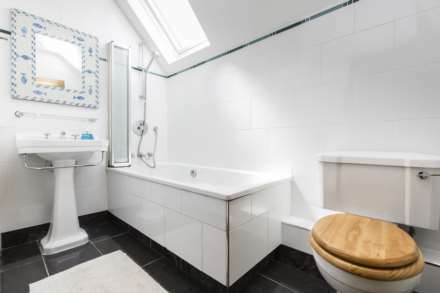 Cloakroom: low level WC with wall mounted cupboard above, pedestal wash hand basin, tiled floor with electric underfloor heating and extractor fan. En-suite: front aspect part opaque stained glass window, tiled shower cubicle with wall mounted shower unit, low level WC, vanity unit with wash hand basin above and cupboards under, tiled walls and flooring, heated towel rail and radiator. 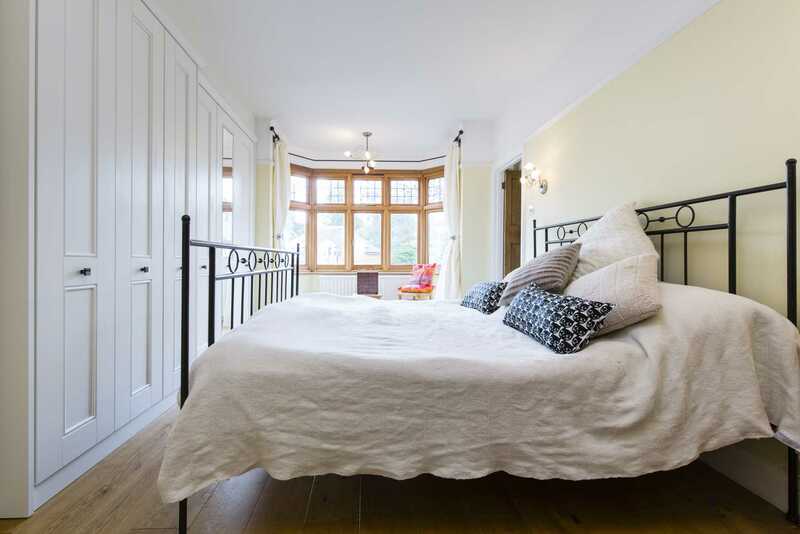 Bedroom 2: 15`1 x 11`2` rear aspect part leaded double glazed windows with views of the rear garden, fitted cupboard with internal hanging rail and shelving, alcove shelving and radiator. Bedroom 3: 16`1 x 9`2` rear aspect part leaded double glazed window overlooking the rear garden, double glazed Velux window to rear in sloping ceiling and radiator. Bathroom: side aspect double glazed Velux window in sloping ceiling, panel enclosed bath with mixer tap, wall mounted shower unit and folding glass bath shower screen, pedestal wash hand basin, low level WC, radiator with heated towel rail, wall inset storage unit with obscure glazed door and internal shelving, tiled walls and flooring. Bedroom 4: 10`10 x 7`10` part leaded font aspect double glazed window overlooking the street and radiator. 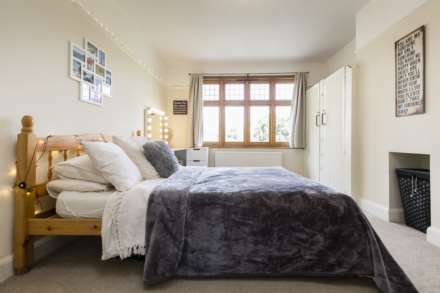 Bedroom 5: 21` x 14`5` dual front and rear aspect double glazed Velux windows in sloping ceiling, wooden floor, open recess with fitted shelf, eaves storage areas and radiators. 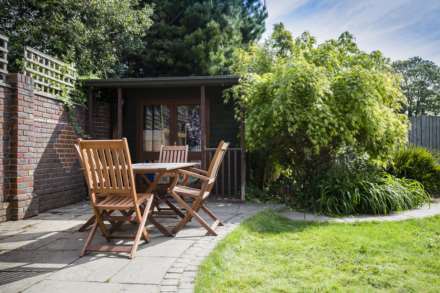 Outside: to the front of the property is a paved off road parking space for two cars with perimeter wooden gates and a mid-height curved brick wall to the front, a flower bed behind. To the rear is a garden laid mainly to lawn with a paved terrace area and a part glazed summer house with light and electricity and a veranda at the rear. A perimeter brick wall and perimeter fencing on both sides enclose the garden and a curved pathway edging flower beds with mature trees, plants and flowers winds down the side of the house giving access to the front of the property. Southborough Common, situated towards Pinewood Gardens` end of the village, is a conservation area where cricket has been played for more than 200 years. Even closer to Pinewood Gardens, is the open green space of the Ridgeway Playing Fields which provide lots of room for kids to play, games of footballl and dog walking. Excellent secondary, independent, preparatory and private schools can be found in both Tunbridge Wells and Tonbridge, while Southborough and Bidborough have their very own primary schools. 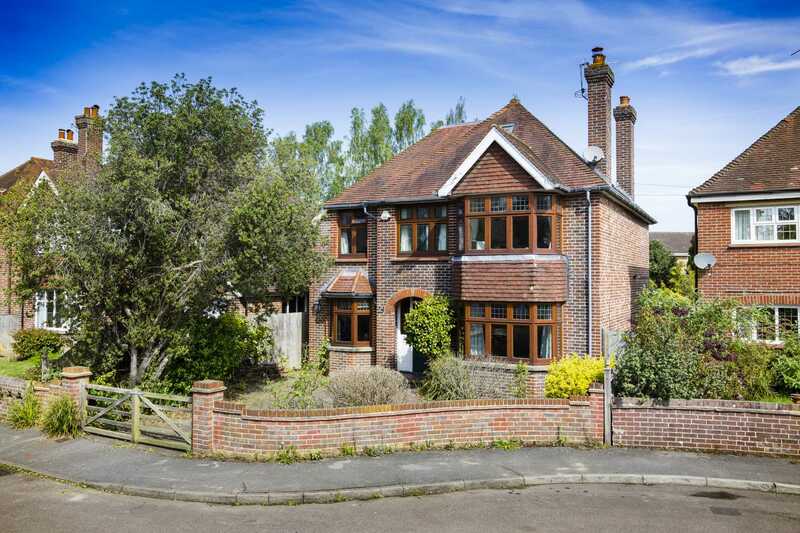 Pinewood Gardens is also within the catchment areas for the 5 highly regarded and sought after Tunbridge Wells and Tonbridge Grammar Schools.